The bathroom cabinets are set in place at the same time as the kitchen cabinets. We purchased matching cabinetry for the entire house, adding some continuity to the overall look of the interior of the home. Again, the cabinets are secured, with plumbing and electrical run inside them in preparation for the countertops and sinks. When renovating one's home, it is essential to give special attention to the bathrooms. 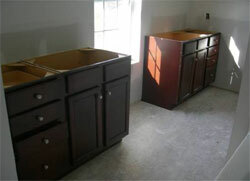 Bathrooms, kitchens, and basements are where you get the most sustained value out of the renovation. It is close to dollar for dollar on what you spend to renovate your bathroom. This will add to the value of your home significantly. Bathrooms are where homeowner's spend a lot of private time. Contrary to the opinion of many, there are now various available options when it comes to renovating bathrooms. There are now different types of bathroom cabinets and vanities available from different manufacturers. If you want to do a themed bathroom, one option would be to hire an interior designer. The designer would immediately know which items to shop for based on the theme the homeowner wants to have. Choosing bathroom cabinets and vanities can be challenging especially if you only have a limited amount of knowledge on the different types cabinets and vanities. Cabinets are especially important in bathrooms. They do not serve only as storage solutions, but also complete the overall look of the bathroom. The following are the types of bathroom cabinets that you can find being sold in the market. Wood is considered the most versatile material to be used for bathroom cabinets. Most schemes used in bathrooms include the color brown in different shades and this is one reason why wood is preferred by many. Aside from its aesthetic purposes, it also gives texture to the bathroom's overall look and gives a natural look and a feeling of serenity in the bathroom. Using wooden furniture is a way to make your bathroom look classy and not too trendy. It would also be easy to look for other furniture and decorations which would match with wooden bathroom cabinets. Bathroom cabinets made from glass will give your bathroom a trendy and sophisticated look. Most young homeowners prefer to install this type of bathroom cabinet because it can easily blend with any surface and with any wall design in the background. The doors of these cabinets can either be transparent, frosted, or tinted. In modern houses nowadays, most bathrooms are themed using glass of varying textures and tints. Homeowners should take a bit more care since glass is fragile and it should be polished and constantly wiped for the cabinets to keep their polished and shiny appearance. Metal is now a popular material when it comes to manufacturing modern furniture. People should know which type of metal to use. The best option lies in stainless steel One reason for this is that they do not rust. Bathrooms are always wet and damp; therefore using a type of metal which does not rust is a good choice. Not all manufacturing shops sell them, but you can have contractors customize them for you. Both the metal and the glass types of bathroom cabinets are the preferred ones for houses built under the modern theme. The types of bathroom cabinets above can be used for several themes homeowners would like to apply to their bathrooms. Interior or home designers can help you in choosing the right bathroom furniture to go with your chosen bathroom theme. Here are a few suggestions that you might like. Aside from the bathroom cabinets, one can use various bathroom vanities to match your chosen bathroom cabinets. You can choose from different vanity sinks, vanity furniture for handicapped persons, taps and fixtures, and many more. You might want to visit your local plumbing supply stores to see different bathroom models set up. Make sure that in choosing which bathroom cabinet to use for your bathroom, you should be able to assess both the price and the quality of the materials you are buying. Sturdy furniture is a must in bathrooms since a majority of home accidents happen in the bathroom. 8 > Sod or Grass? 26 > Exterior - Roof & Win. © From Plat to Place - All Rights Reserved.